Future Doctor Foodie – Emrie. 25. Learning to cook one fail at a time. You’ve seen it on Instagram, you’ve seen it on Buzzfeed, you’ve seen it all over the Internet – trendy, stylish foods that toe the line between disgusting and impressively creative. Yet we can’t get enough! We line up for hours to try rainbow bagels and cookie dough served in ice cream cones. We “do it for the ‘gram.” We are foodies. I am one of these foodies. I watch Food Network, I follow more food Instagram profiles than anything else. I’ve made lists of restaurants to try. I can name exotic foods and spices, and I yell at Chopped contestants like I’m watching football. But I also have a secret… I never actually learned how to cook. I was a picky eater as a child. No one in my family ever seemed to be particularly excited about food. Growing up, I saw cooking as more of a chore than a hobby. Once I got into food, I found myself wanting to make the dishes I saw on Pinterest or practice the skills I saw on TV. In 2015, I started this blog on another platform. Now I’m continuing that blog here as of 2018. The point of this blog is to document both my pre-med journey and my culinary exploration and share it with my readers. I hope to share the lessons I’ve learned, as well as my successes and many failures. I feel learning to cook is not only a great hobby, but a way to encourage a healthy lifestyle while I pursue my dream of being a physician. Easter is a time for brunches and family dinners, but it’s also a time for candy and sweets straight from the Easter bunny! When you’re going to see your friends or family for a party or dinner, you should always bring something with you. Here’s a sweet treat you can bring for dessert without too much frantic effort. Plus they’re adorable! Happy Easter! Enjoy these cute Easter dirt cups. 1. Line a baking sheet with parchment paper or a silpat. 2. Melt the bag of candy melts, except for about 15 discs. 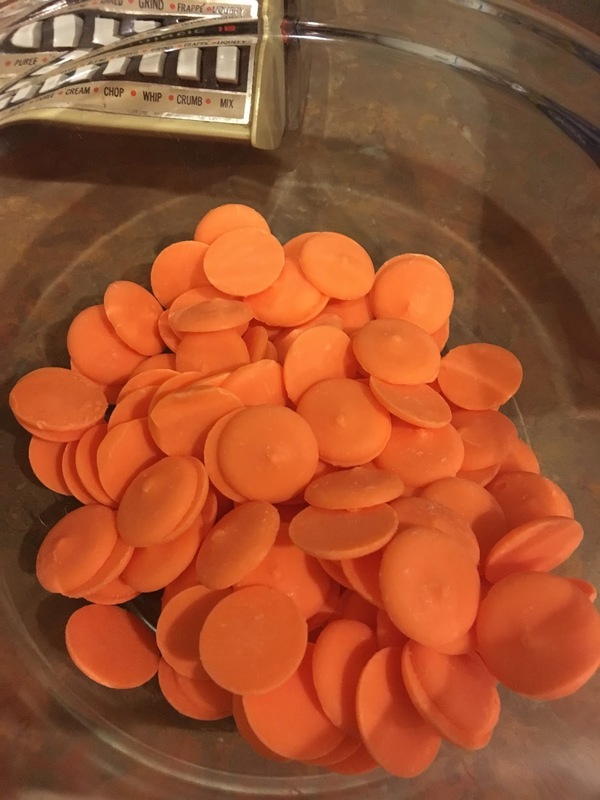 I used the microwave to melt the chocolate discs. I put it in a small glass bowl for 1 minute. Then repeat in 30 second intervals, stirring each time. 3. Grab the strawberries by the stem. Dip both sides in chocolate, then place on the parchment paper. Repeat with all the strawberries. 4. 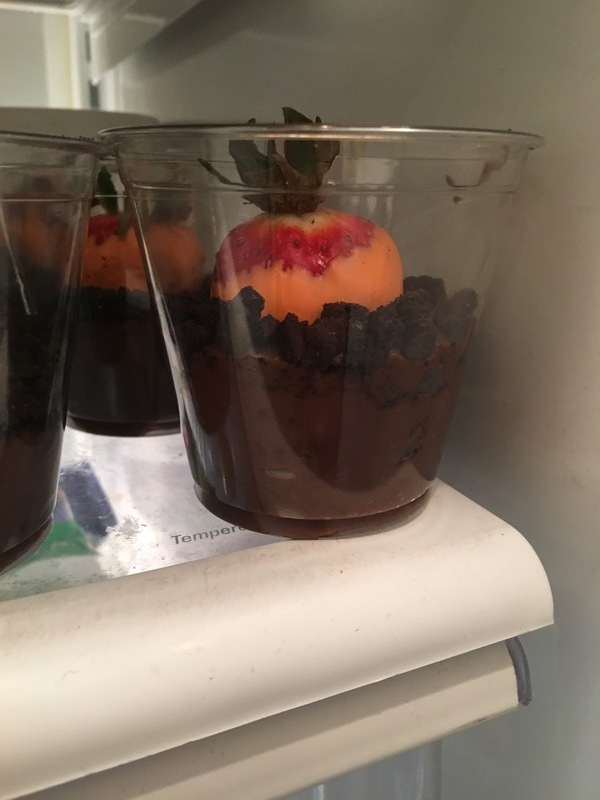 Put the strawberries in the fridge until the chocolate hardens. 5. Take a sandwich bag and cut the tip of it off. Melt the rest of the discs. Pour the melted chocolate into the sandwich bag. Close the bag and twist it. Drizzle over the strawberries. Let sit. 6. Make the chocolate pudding according to the instructions on the box. I made the pudding first so it could sit in the fridge while I worked on everything else. 7. Put some crushed Oreos on the bottom of some clear cups. Pour pudding over top of them. 8. Top with more crushed Oreos. Press a strawberry into the center. 9. Refrigerate until you’re ready to serve/bring them to the party! Final Thoughts: Mine turned out a little differently. 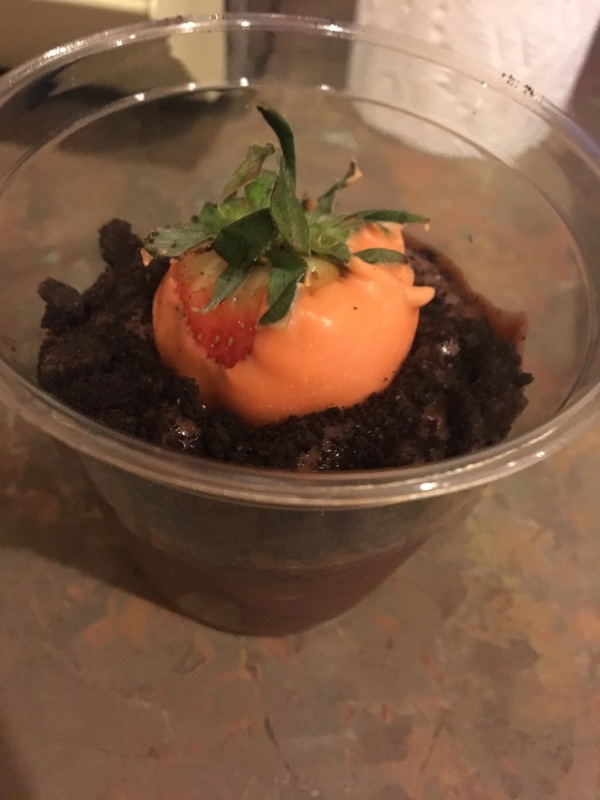 I didn’t drizzle the strawberries with more chocolate, and I didn’t put Oreos on the bottom of the cup. These were a hit at the Easter party at work! And they are so incredibly adorable. A big group of them together is like a little garden! Compiling a medical school list is as much of a strategy as studying for the MCAT. After months of research, studying, and comparing requirements, I have a tentative list of medical schools to apply to for the upcoming cycle. The AAMC application opens on May 1, 2019. Though I don’t have my MCAT score, I have a general idea of my personal stats. Applying to these schools is expensive, so I’m limiting myself to 13-15 schools for this cycle. I’m still debating on whether I want to apply to the Texas Application System. I looked for schools where I have support systems and where I felt I could live without too much “culture shock”, if you will. This means many of my schools are located around the Southwest. Being located in the Southwest does not guarantee admission of course. A school in Utah stated that they basically left only 8 slots for out-of-state students. I’m not applying there with such slim chances. Schools 10-13 might be considered “reach” schools, but I have reasons for choosing them. There’s always a chance that I score high enough on my MCAT to make it past the admissions filters. I’ve got 2 Texas schools as well, which I don’t think makes it worth it to apply to the separate Texas application service… Of course, the list might change once I get my MCAT scores, but we’ll have to wait until June before I know anything. What do you think of my school list? Are you applying to any of the same schools? Share your lists with me!! After almost 10 years, my laptop finally gave up the ghost. This means I’ve lost all my photos (at least for now). Hoping to get a new laptop soon and get the blog back up and running! Losing weight for a healthier body and lifestyle is common medical advice. By age 18 I was nearly 200 lbs. My parents worried about my weight, but I felt pretty good about myself. I started exercising my freshman year of college with my best friend. I remember walking around in sweatpants and a sports bra, thinking I looked really good. I’m not 100% sure what happened. By the time I got to my goal weight, it became exhausting to step on the scale. I weighed myself daily, panicking at the slightest gain- I’m talking 1-2 pounds. I would call Boyfriend in tears, terrified of gaining all of the weight back. My biggest goals for myself this year are self-care and self-love. I’ve been working harder in the gym, strengthening my body and accepting the changes that come with building muscle. Today I am about ten pounds heavier. I’m not 100% sure since I haven’t weighed myself very consistently. My pants size hasn’t really changed. I’ve noticed changes in curves, but more than anything, I can lift more, I can run longer. I feel healthier and I’m not torturing myself for enjoying certain foods. The diet mentality tends to label foods as “good” and “bad.” An Instagram account previously called #nutribollocks has been phenomenal in combating shame. I focus more on honoring my hunger and respecting my fullness. Granted, there is still a balance in what I’m eating. On Sundays I get to sleep in a little before Boyfriend comes home and we go the gym. After the gym we may grocery shop. I’ll cook us a large breakfast to help us recover from the work-out. Some mornings Boyfriend prefers to sleep in, so I get a quiet morning to myself. This happened last Sunday, so I decided to try a warm oatmeal recipe for the cold morning. Oatmeal is a healthy breakfast choice with lots of fiber. Overnight oats are classic, but sometimes I like to cook old-fashioned stove top oats. Since I prefer sweet oatmeal, these caramelized bananas (with coconut oil instead of butter) offer sweetness without going overboard! 1) Heat 2 cups of milk in a pot until it boils. Add 1 cup oats and cook about 5 minutes, stirring occasionally. Cover and remove from heat. Let sit about another 5 minutes. 2) Heat the oil in a skillet over medium heat. Add the maple syrup, cinnamon, and vanilla, and let it bubble until foamy. 3) Add bananas and simmer for a few minutes on each side until soft and plump. I chose not to stir in the bananas for myself, but I assume this makes a creamier texture. I did not pour the remaining syrup into my oatmeal either; I’m pretty sure it would be too sweet if I did. Add some chocolate chips and it’s done! Final Thoughts: This surprisingly did not take as long as I thought it would! It may not be a work day breakfast, but it was certainly quick. I’ve never cooked anything with coconut oil, so I was quite surprised that I didn’t get an underlying coconut flavor. I’m assuming the other flavorings masked the coconut (or perhaps I need new coconut oil). This was a sweet and warm, healthy start to my week. Each year I take a look at what I’ve cooked/baked and what I’m hoping to learn in the future. This year I was unpleasantly surprised to find that I barely made any of my 2018 goals. Out of these fifteen goals, I made roast chicken, quesadillas, scones, and mashed potatoes. I’ve never met every single goal in a year, but I’m usually more dedicated to my goals. This year I’ll be trying something a little different. Keep following and I’ll be less mysterious! Updates to come soon! It was the day before Thanksgiving. The menu was planned, the shopping done. I planned on baking pies and chopping vegetables once I got home. Only a few patients to see that day, one a new patient. Usually my NP doesn’t see new patients, as initial evaluation is left to the physician. She was flustered about seeing this patient she’s never met. Rushing into clinic to see the NP usually means something is urgent. This particular patient was highly symptomatic following a procedure by another provider. Unable to provide an explanation for her sudden shortness of breath, that provider referred her to our clinic. The sudden onset and change in her symptoms frightened the patient and her husband. A young woman who enjoyed exercising was panting after walking less than 10 feet. Looking over the results from labwork, procedures, and imaging didn’t reveal a clear picture. She looked at us, pleading for answers with big, round eyes. She held her hand tight as her husband helped answer questions so she could catch her breath. Imaging showed an abnormality, not explained by the most common diagnosis. The suspicion arose for cancer, though more testing would be needed. By the way her face fell, she had obviously not considered such a disastrous possibility. Her procedure was supposed to be simple and easy. From a cardiac perspective, it had been successful. Now she and her healthcare providers were forced to contemplate more malignant causes. Despite working in a medical clinic, I’m not accustomed to seeing my patients die. We primarily see patients with atrial fibrillation, a treatable and manageable disease not likely to be the sole cause of death. The interventional team has to worry about death from heart attacks, while the heart failure team deals with high risk transplant candidates or LVAD patients. Cancer is usually handled by outside physicians specializing in other bodily systems and/or oncologists. Right before the holidays, even the most remote possibility of cancer seemed devastating. It was difficult to hold myself together for the patient’s sake. One of the research physicians suggested that I begin hospice volunteering. Despite all my research and reading book after book about death, I have little experience with confronting the ultimate partner to medicine. Perhaps it’s best I heed his advice. This month’s reading focused on a sensitive topic – religion. When people mention religion and medicine, most people jump to abortion; however, there’s a frightening array of issues that involve religion in the setting of modern medicine. 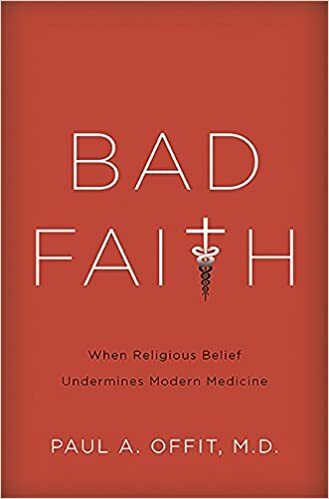 Bad Faith: When Religious Belief Undermines Modern Medicine covers these topics in depth. The preventable deaths caused by “faith healings” is the main focus of this book. Several church groups and religious organizations shun the advancements of modern medicine on the basis of faith. Most notably, “Christian Scientists” refuse all medical treatments except those to set broken bones and a few other necessary treatments. Vaccinations, surgeries, antibiotics, and most medications are strictly forbidden by the Church. Instead, they seek “treatment” in the form of prayer. Religious belief is a touchy subject. Many providers have difficulty understanding why people would refuse life-saving care in favor of prayer. There is little debate in how adults can choose to treat themselves. If a Jehovah’s Witness refuses a much-needed blood transfusion, that is their choice to make. This is the same for any patient, whether or not they choose this for religious reasons. Legal adults of sound mind are able to sign AMA (against medical advice) forms. The greater problem lies in the children of these “faith-healers.” On the basis of their religious belief, parents deny their children medical care – which lawmakers refer to as “medical neglect. In the state of Arizona, there are multiple religious protections in place, including protections to avoid vaccinating school-age children. Although anti-vaxxers (religious or otherwise) have been refuted repeatedly due to overwhelming evidence in support of vaccinations, many continue to refuse to vaccinate their children against potentially deadly diseases. It is my strong opinion that every adult person should be able to dictate their care. They have the right to refuse medical treatment and care. That belief, however, should not automatically apply to their children. An infant or a child cannot consent to medical care. In the medical community, we rely on the patient’s parents or guardians to provide that consent. The issue is that children cannot refuse medical care either, which unfortunately falls to the responsibility of the parents. The default practice should be, then, to provide care when children are sick and in emergencies, regardless of parental consent. The type of care provided may be subject to religious relief (such as avoiding blood transfusions), but parents should not be able to refuse care completely. Naturally that creates the issue of where the boundary lies. Providers and medical staff often end up court-ordering care for pediatric patients, which depends on the decision of a judge. “Faith healers” can specifically refer to Christian Scientist “practitioners” who provide “care” in the form of prayers. The quotations are there because these people in no way provide actual medical care. Under Arizona law, these people are exempt from medical licensing. They can provide “care” yet they are not liable for the outcome of their “patients,” nor are they regulated in any way. This lack of accountability is something a physician would never dream of, a point made in Paul Offit’s book. Doctors can be part of the problem as well. Per Arizona law, doctors and medical personnel can refuse to provide services based on their religious beliefs. This means refusing to prescribe birth control, perform abortions, collect umbilical cord blood (for stem cells), and end-of-life care. Notice that most of these cases are related to women’s health. (If you have the time, read Justice Ruth Bader Ginsburg’s scathing dissent of the Hobby Lobby ruling and the importance of reproductive rights). One pharmacist made headlines for refusing to provide a patient with abortion-inducing medication (even though the fetus had already died inside her.) Physicians and other healthcare providers should be required to perform and provide the services needed of them. In the same way that providers would have to respect a patient’s religious belief, providers should respect their lack of religious belief. Jehovah’s Witnesses do not believe in blood transfusions. I disagree with this, but I would respect that adult patient’s wishes. By the same logic, a patient requesting an abortion (for any reason) should be able to receive that procedure safely from a doctor, regardless of whether the doctor personally objects. A doctor’s personal conflicts, political leanings, or religious beliefs have no place in patient care. The physician is not a god, is not a judge of people’s moral actions. The physician’s duty is to provide the care needed. I don’t have anything against religion in particular. In fact, Mr Offit’s book makes several points about the importance of faith. He even uses the New Testament and Jesus’ treatment of children to support medical care and protection for children. I would also like to note that some of the cases mentioned in the book involved religions and religious leaders who explicitly recommended medical care for the sick and dying, which individuals chose to ignore. The issue isn’t religion, but how religious belief becomes warped and causes harm in the realm of medicine.